Phagocytosis Assay, Red Blood Cell Substrate | Cell Biolabs, Inc.
Phagocytosis can be assayed by measuring the engulfment of a cell "substrate". The most common substrates used in phagocytosis assays are erythrocytes (RBCs) and zymosan particles. However, traditional assays require tedious cell counting under a microscope. Our CytoSelect™ 96-Well Phagocytosis Assay, Red Blood Cell Substrate provides a more accurate, user-friendly, high-throughput alternative to the standard phagocytosis assay. The assay may be adapted for use with 24-well or 48-well plates. 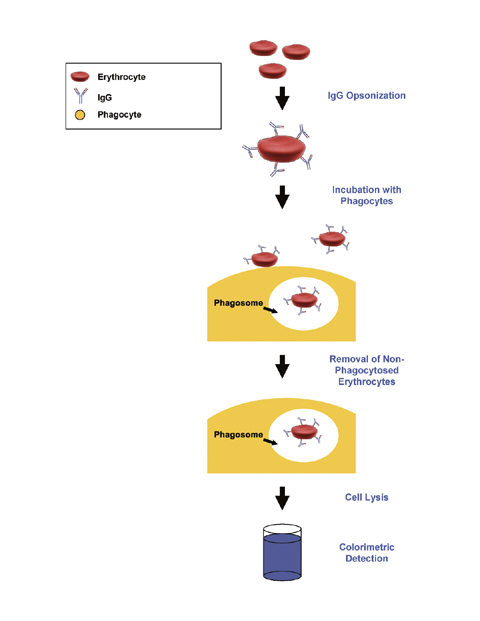 Figure 1: Assay Principle for the CytoSelect™ 96-Well Phagocytosis Assay (RBC Substrate). Red blood cells are opsinized and incubated with phagocytes. Non-phagocytosed RBCs are removed, followed by lysis of phagocytes and detection of engulfed RBCs on a standard microplate reader. Coffey, G. et al. (2016). PRT062607 achieves complete inhibition of the spleen tyrosine kinase at tolerated exposures following oral dosing in healthy volunteers. J Clin Pharmacol. doi:10.1002/jcph.794. Amara, S.et al. (2016). High salt induces anti-inflammatory MΦ2-like phenotype in peripheral macrophages. Biochem Biophys Rep. doi:10.1016/j.bbrep.2016.05.009. Min, E. Y. et al. (2015). Effects of waterborne nickel on the physiological and immunological parameters of the Pacific abalone Haliotis discus hannai during thermal stress. Environ Sci Pollut Res Int. doi:10.1007/s11356-015-4597-1. Yu, Z. et al. (2015). Therapeutic concentration of lithium stimulates complement C3 production in dendritic cells and microglia via GSK-3 inhibition. Glia. 63:257-270. Aflaki, E. et al. (2014). Macrophage models of Gaucher disease for evaluating disease pathogenesis and candidate drugs. Sci Transl Med. 6:240ra73-240ra73. Park, S. Y. et al. (2014). Immunostimulatory effect of fermented red ginseng in the mouse model. Prev Nutr Food Sci. 19:10-18. Lee, J.K. et al. (2011). Regulator of G-Protein Signaling-10 Negatively Regulates NF-kB in Microglia and Neuroprotects Dopaminergic Neurons in Hemiparkinsonian Rats. J. Neurosci. 31:11879-11888 (#CBA-220). Winnicka, B. et al. (2010). CD13 is Dispensable for Normal Hematopoiesis and Myeloid Cell Functions in the Mouse. J. Leukoc. Biol. 10.1189/jlb.0210065 (#CBA-220). Dowling, D.J. et al. (2010). Major Secretory Antigens of the Helminth Fasciola Hepatica Activate a Suppressive Dendritic Cell Phenotype that Attenuates Th17 Cells but Fails to Activate Th2 Immune Responses. Infect. Immun. 78:793-801 (#CBA-220). Hamilton, C.M. et al. (2009). Fasciola Hepatica Tegumental Antigen Suppresses Dendritic Cell Maturation and Function. Infect. Immun. 77:2488-2498 (#CBA-220).